Not to be confused with Gandharva. In Jainism, the term Ganadhara "Apostle" is used to refer the chief disciple of a Tirthankara. In samavasarana, the Tīrthankara sat on a throne without touching it (about two inches above it). Around, the Tīrthankara sits the Ganadharas. According to Digambara tradition, only a disciple of exceptional brilliance and accomplishment (riddhi) is able to fully assimilate, without doubt, delusion, or misapprehension, the anekanta teachings of a Tirthankara. The presence of such a disciple is mandatory in the samavasarana before Tirthankara delivers his sermons. Ganadhara interpret and mediate to other people the divine sound (divyadhwani) which the Jains claim emanates from Tirthankara's body when he preaches. The monastic sangha of Jainism is divided into a number of orders or troupes called ganas, each headed by a ganadhara. In 20th century, statues depicting Tīrthankaras and Ganadharas were unearthed in Mayurbhanj district of Odisha. "Surely, this is not an occasion for grief, for the Lord has gone to the everlasting Abode of the Immortals, which you and I even are also going to reach very soon! After this, Bharata recollected himself, touched the feet of Ganadhara Vrisabha Sen and left for his kingdom. ↑ Jain 2008, p. 95. ↑ Jain 2008, p. 96. ↑ Jain 2012, p. xi. ↑ Dundas 2002, p. 37. ↑ Jain 2008, p. 126. 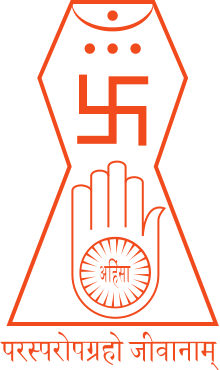 ↑ Champat Rai Jain (1929). "XI. Ganadhara Vrisabha Sen". Risabha Deva - The Founder of Jainism. K. Mitra, Indian Press, Allahabad. p. 189. Note: Acharya Umaswati is accepted by both Digambara and Śvetāmbara as their Ascetic.